In his letter dated 14 November 1945 asked the Dutch naval liaison officer captain Krediet the British Admiralty if it was possible to loan six former German R-boats to be used for minesweeping tasks in the European waters and especially not in the Far East. They were to be manned by Dutch sailors. He suggested to use one of the German flotillas already active out of Dutch ports of which the boats were fitted out with ordinary screws. If this load was approved the Royal Netherlands Navy intended to return to the Admiralty the motor launches (ML.s) 138, 143, 161-162, 164 and 260 which she al that moment loaned. Further more referred Krediet to a letter dated 20th October 1945 in which for a period of 3 months the loan of 4 Cropesa fitted motor launches (ML.s) was approved. In a response dated 29th December 1945 wrote the secretary of the admiralty to captain K.J.F. Krediet of D.N.L.O. 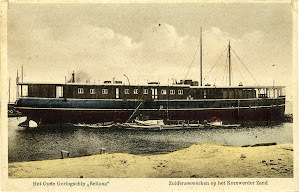 that he hoped that on short notice a flotilla would be available and that at the moment was considered what would be the most suitable to meet the Dutch requirements.